Do you feel that your skin looks and feels as healthy and youthful as it used to be? Over the years, the sun, wind and toxins begin to take its toll. As we age our skin may become dull. 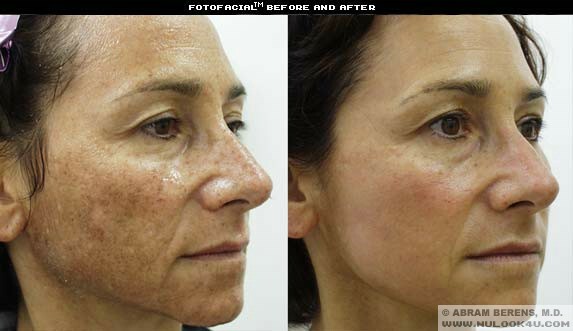 Dark blotches, fine lines and other signs of sun damage and aging begin to appear. With today’s advanced technology aging skin can be a thing of the past. No longer is there a need to take time off from work or change your lifestyle in order to achieve and maintain youthful skin. Glycolic Wash is an Alpha-Hydroxy acid that in it’s natural state, is found in sugar can juice. It has been used for centuries, and currently Dermatologists and Plastic Surgeons use it for treating dry skin, acne, and warts. Most patients experience softening of fine lines, reduction in coarse lines, increased skin smoothness, lightening of pigmentation irregularities, an increase in the skin’s glow, and a minimization of pores. A Chemical peel is an effective way to rejuvenate sun damaged, weathered, wrinkled, blemished, blotchy, uneven or Acne-scarred skin. It can give you smoother, more even skin tone and texture. Your skin will look tighter and fresher than before. It will not, however, erase all facial flaws. Deeper lines, wrinkles and other flaws may require other treatments. This treatment is safe and effective when used around the mouth, forehead, under the eyes and other areas of your face. The more common chemicals used are TCA (Tri-chloro-acetic acid) and Phenol. TCA is utilized for fine lines and wrinkles, pigmentation and superficial blemishes. Phenol is used more for full face peels to reduce wrinkles, sun damage and discoloration caused by birth control pills or pregnancy. 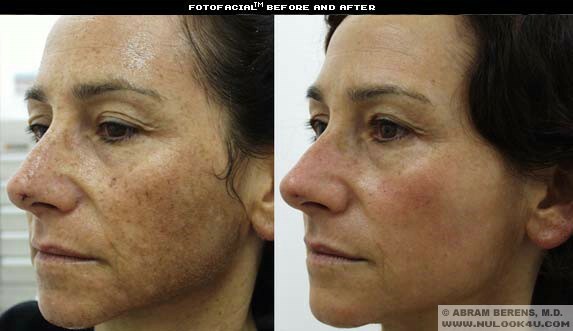 Abram Berens, M.D., is pleased to introduce the FotoFacial™ Treatment. Now, better looking skin can be yours in a flash of light. 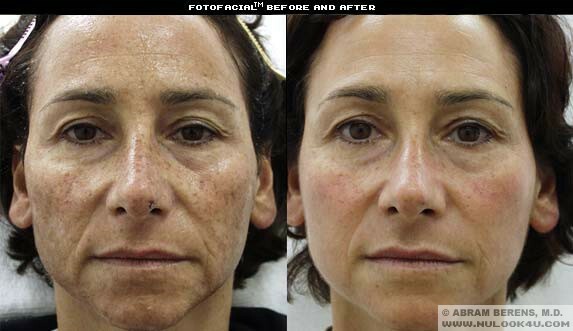 FotoFacial™ Treatments eliminate redness, broken capillaries, brown spots, and reduce fine wrinkles and large pores. With no downtime! All patients observe smoother skin with visible improvement in irregular pigmentation, fine wrinkles and pore size. Flushing, redness and symptoms of rosacea improve on average more than seventy-five percent following treatments. Each treatment takes 45 minutes, requires no anesthesia, and patients are able to return to full activities immediately after treatments.